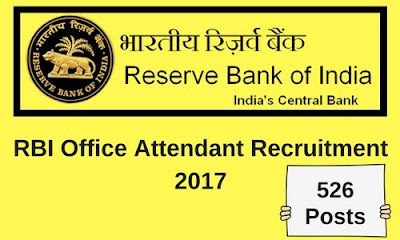 Reserve Bank of India invites applications from eligible candidates for 526 posts of “Office Attendants” in various offices of the Bank. Selection for the post will be through a country-wide competitive Test (Online Test) followed by Language Proficiency Test (in Regional Language). Schedule of Online Test (Tentative): December 2017/January 2018. The online Test could be conducted on weekdays or weekend. 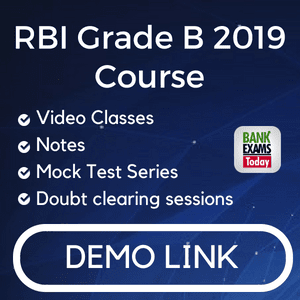 RBI reserves the right to modify the number of days and dates of the test depending on the number of applicants. Between 18 and 25 years. Candidates must have been born not earlier than 02/11/1992 and not later than 01/11/1999 (both days including) are only eligible to apply. Relaxation as per the RBI's norms. A candidate should have passed 10th Standard (S.S.C./Matriculation) from the concerned State/UT coming under the Regional Jurisdiction of the Recruiting Office to which he is applying (Refer Annex III). Such qualification should be from a recognized board. andidate should be a domicile of the State/UT coming under the Regional Jurisdiction of the Recruitment Office to which he/she is applying for (Refer Annex III). The candidate should be an undergraduate as on 01/11/2017. Graduates and candidates possessing higher qualification are not eligible to apply. Bank reserves the right to call for any document in support of domicile status of the candidate. (S.S.C./Matriculation) and rendered at least 15 years of defence service, provided they have not graduated outside the Armed Forces. 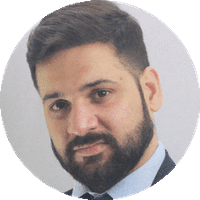 Candidates applying to a recruiting office should be proficient in the language (i.e. know to read, write, speak and understand the language) of the state/UT falling under that office.